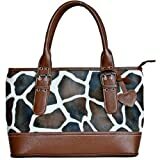 The best prices on new and used brown leather handbags! Handcrafted by skilled craftsmen in very limited quantities. Fair Trade cooperative pays a fair wage to workers in the local context.